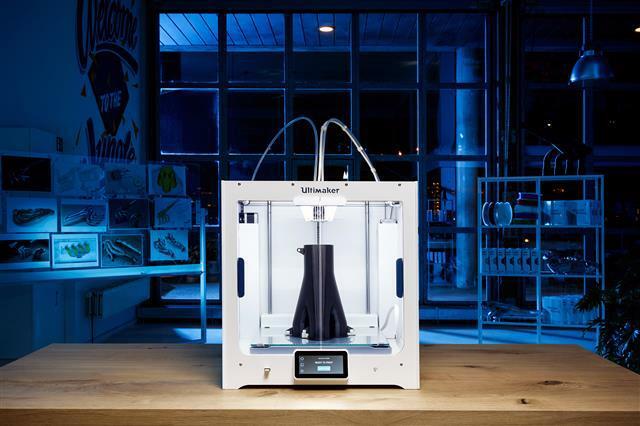 Dynamism is proud to welcome Ultimaker’s latest 3D printer - the Ultimaker S5. The Ultimaker S5 is a powerful, reliable, and versatile 3D printer that delivers industrial-class results. Dynamism is proud to welcome Ultimaker’s latest 3D printer - the Ultimaker S5. Built for the office, the Ultimaker S5 is a powerful, reliable, and versatile 3D printer that delivers industrial-class results. The new Ultimaker S5 is designed to enhance performance with advanced features and unparalleled reliability. Dynamism is excited to offer the latest from the Ultimaker portfolio and provide expert support to meet your printing needs. Reserve your Ultimaker S5 here. The Ultimaker S5 packs powerful technology in a frame designed for the office. The front doors ensure that build envelope conditions are optimal. An intuitive touchscreen interface and clean, white frame lights allow users insight into their print’s progress. And the embedded power supply gives the printer a clean footprint, making it ideal for shelf or rack mounting. Ample build volume allows you to print large-scale objects - get the dimensions that you designed for. And when used with Cura Connect, groups of Ultimaker printers can work together to maximize production volume. Advanced active leveling technology creates a detailed height map of the build platform before beginning your print, allowing for a perfectly flat initial layer and eliminating the need for constant monitoring. To get the best results over a range of materials, the Ultimaker S5 includes swappable build plates: hardened glass for general use, and ultra-flat anodized aluminum (available Fall 2018) for engineering materials, such as ABS, CPE+, and PC. A 750g spool of Ultimaker’s newest material, Tough PLA, is included with each Ultimaker S5. Tough PLA has similar mechanical properties to ABS, with high impact strength, yet reliably printable. It’s a great material for large functional prototypes, tooling, or manufacturing aids. The new Ultimaker S5 and Tough PLA are available from May 15th 2018. Localized support, training, and aftercare are included with every purchase. Reserve yours at dynamism.com today.